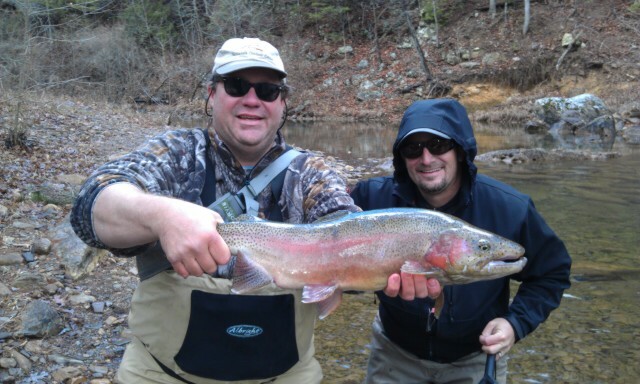 Adam Harman ,Guide – Born and raised in Southwest Virginia. Adam lives in Winston-Salem with his lovely wife Erin and his two beautiful children, Jonah and Olivia. As a young boy his Dad and older brothers taught him how to fish but he didn’t really take up fly fishing until he was 25. His passion for fly fishing truly developed when his father-in-law gave him his first fly tying kit for Christmas (my wife sarcastically still thanks him for that to this day). Adam loves to teach fly fishing/tying and share it with others. 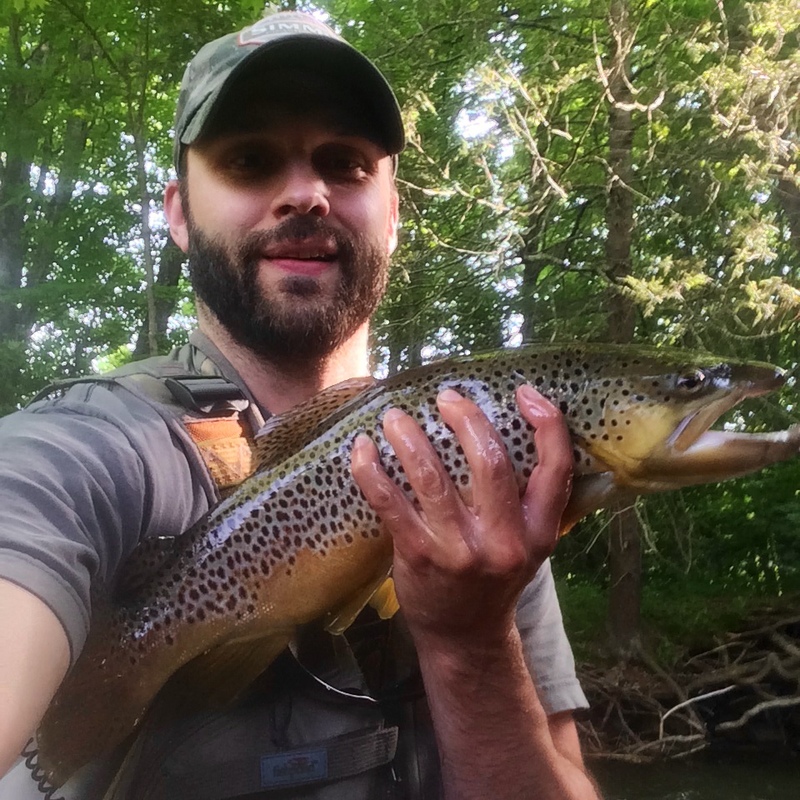 In his spare time Adam loves to spend time with the family, tie flies and go fishing in the Virginia and North Carolina mountains. Adam personally thanks God for the ability He has given him to tie and fish, his Dad for getting him into fly fishing, his wife Erin who has been patient, understanding and very supportive. FUNNIEST, MOST EMBARASSING FISHING MOMENT…Yeah, I have too many of them. I was about 12 and my brother and I were fishing in a canoe on Little River in Floyd, VA. I got my spinner hung up in a tree and as I was trying to jerk the spinner out of the limb, it flew back behind me and smacked my brother right in the face. Luckily, it only led to a black eye. Jeff Wilkins, Guide, Owner/Proprietor – I have my first memories of fishing with my father. It is he who took me fishing first when I was barely tall enough to hold a rod. Little did I know then that a 10 inch rainbow would kindle a fire of passion, one that has always burned and still burns passionately today. Thank you Dad for introducing me to fishing. My dad was a great man in many ways and taking me fishing a lot was just one of them. Fishing has been something I have enjoyed for over 40 years now. In addition, I have enjoyed flyfishing for the past 30 years, and professionally for 27. You may ask “us?” When you pursue a passion in the fly fishing industry, or any outdoor industry for that matter, it takes the unwavering support of a whole lot of folks to make things work. I am blessed to have two boys and a wife who also love the outdoors, and it is a part of our lives in a very special way. Its one of our favorite places and ways to spend our free time. On a Wyoming trip one summer, my group and I were floating the Green River below Daniel Junction with Steve Wilkerson, a friend of mine from college/UNCG. We pulled up on a nice run/pool and stopped for lunch. Steven busted open a bag of barbeque potato chips and the bag burst open and several large chips went into the drink. A few minutes later we noticed a nice head poking through about 25 yds below us. It was a huge wild Green river cutthroat. Don’t know if it was the bright orange color of the chips, the taste, or what, but that fish starting gorging on them. Steve threw another handful. And another. Minutes later, we pulled up anchor, and my client Charlie Peters made a cast to the fish, with a red/orange tarantula….whammo. The cuttie slurped down the fly. FLY FISHING HAS BEEN GREAT FOR ME, TO ME….. I have been told and I am sure its been said that you shouldn’t mix your beliefs with business and sometimes you will offend people…..but friends to be quite honest with you all that I have, all I will ever do, all I will ever be wouldn’t be possible if it weren’t for Jesus Christ. I attended both Forsyth Technical Community College and the University of North Carolina at Greensboro. I worked and attended school, and guided trips and tied flies on the side. Since that time, I have been involved in four retail fly fishing operations, and traveled both locally and to different areas of the country fly fishing, guiding, tying flies, and teaching fly fishing and fly tying. I am a Federation of Fly Fishers Certified Fly Casting Instructor, and have taught fly fishing and fly tying curriculums at both the University of North Carolina Greensboro and Guilford Technical Community College. Both schools for the past several years have offered a great medium in which to share skills with others. In the past 27 years I have taught hundreds of people to cast a fly rod, and today it remains one of the most enjoyable things I do. Fly tying is a passion of mine as well, as I believe that sometimes the fly is what makes the difference. Frequently I tie commercially for sale or hire, and I do lots of special orders. My specialty is flies for tough, selective trout, especially emergers and nymphs. Some of my favorite patterns are published, most recently in Trout Flies of the East by Ted Leeson and Jim Schollmeyer. I also tied the flies for the commemorative print of Charles Kuralt, painted by Bob Timberlake, entitled “Kuralt at White’s Creek”. Some of my local adventures have appeared on FOX 8 WGHP with Roy Ackland of the popular Roy’s Folks Feature, and more recently with Shannon Smith. When it comes to fishing locally, I like fly fishing wherever there’s water—-Trout, bass, panfish, any fish that will take a fly and give a good account of itself. I have fished and guided the Southeastern and Rocky Mountain areas of the west and have extensive experience in fishing and tying flies for each. As a part of my work, I am also an artist, and enjoy doing pen and ink renditions of my favorite flies. In the late summer of 2005 my longtime friend and video expert Tom Jackson of T5 Video in Lexington, NC and I started working on a fly tying and fishing video project. We had talked about doing this for years and we finally were able to do it. The video highlights favorite flies and techniques for rigging and fishing them. We completed the project in the spring of 2006 and are looking forward to doing another project soon. One of our ideas is a video of strictly techniques….hundreds of them. In addition to the above, I also maintain several websites, a fly tying site, a fly fishing site, a fly fishing blog, and an Online Store. My flies, materials, and fly tying kits have sold all over….the UK, Denmark, Sweden, the Netherlands, Japan, New Zealand, Iceland, Spain, France, Italy….even down under to Australia. I am a Pro Staff member or Guide Ambassadeur for/with many companies, including Sage Rods, Simms Waders, GoPro Cameras, Redington, RIO Products, Renzetti Vises, Clackacraft Driftboats, Sawyer Oars, YETI Coolers, CC Filson, fly Tying material and fly company FlyMen Fishing Company , and a fly designer for Holly Flies. When not guiding or tying flies, Jeff can be observed in his Clacka Headhunter skiff headhunting browns, big bass, smallmouths, you name it. Sight fishing for large browns is his favorite, followed by anything on top…be it a trout, a bucketmouth, or a river smallie. Follow Jeff on Instagram…click here . A fisherman since he was a child, Judson developed his love of being on the water with his Dad at Topsail Beach, North Carolina. In his early youth he began fly fishing the streams and rivers of the North Carolina mountains. He started tying his own flies in middle school when his grandfather gave him his first vice. Judson’s love for fly fishing has taken him to many top fishing destinations. Further developing his skills in fly fishing while in college at UNC Wilmington, Judson decided his passion was fishing and began pursuing a career as a professional fly fishing guide. Upon graduation from Sweetwater Guide School in Montana, Judson was hired by Sweetwater to work as a full time guide at their Royal Coachman Lodge. This is one of Alaska’s premier fly-out lodges located in the beautiful Bristol Bay area, a top destination for anglers worldwide. Even though Judson has guided and fished many places, he is always drawn back to chase redfish on the shallow water grass flats of the North Carolina Coast. Muddy Fly is located in Wilmington, North Carolina. We fish from Bald Head Island to the New River in Sneads Ferry, North Carolina. Wilmington is located 2 hours from Raleigh, 3 hours from Greensboro and 4 hours from Charlotte. Wilmington also has a regional airport (ILM). If you need help with directions or accommodations, please call or email. Having whether salt, trout, tailwaters, smallmouth I have personally spent or shared many days on the water with Capt Jud. Just a great guy, Capt Jud and my son, Ben, or Capt. Ben rather, used to share a home right on the water they love and fish, but Jud got married last year. You will have a great time, his infectious ‘fishy’ personality will make for a fun day you will always remember. You can visit him online here . Follow Capt Jud on Instagram here . An angler and hunter since he was a child, Tom developed his love of being on the water with his Dad and his brothers who also loved the outdoors locally, the coastal areas of NC, and Montana. Equally skilled with rod or gun in hand, trout, bass, turkeys, whitetail deer, In his early youth he began fly fishing the streams and rivers of the North Carolina mountains, and also the streams of East TN, most notably the tailwaters. Tom also has fished all over the West, and is well versed in the ways and tactics needed to full tough trout on Montana’s fabled spring creeks and tailwaters…..hallowed waters like the Henry’s Fork in Idaho, and his favorite, the Missouri River….which also happens to be Jeff’s favorite! An affable personality and easy going nature make Tom a great person to spend a day with outside. Easily one of the areas top whitetail deer and turkey hunters, and is also a boat builder….and tinkerer. Tom also designed a skinny water skiff /duckhunting boat that holds a patent. Tom can be found drifting in his Clackacraft Eddy driftboat on his beloved South Holston casting dry flies to rising browns, throwing topwater bugs for big largemouths, or poling his custom skiff for tailing carp. Tom is easily one of the best ‘outdoorsmen’ I have ever met.